In a bowl, mix the ground beef, corn chips, egg, chili powder, cumin, salsa, black pepper and ½ cup of shredded cheese. Mix thoroughly and form into an oval on the baking sheet (not in a loaf pan). 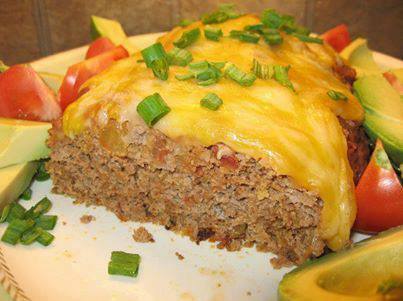 In a small bowl, mix the refried beans with ¼ cup of salsa and frost the top of the uncooked meatloaf with it. Bake at 375° for 45 minutes. The last few minutes of baking time, sprinkle the top of the meatloaf with one cup of shredded cheese and return to oven. To serve, gently slide a thin spatula under the meatloaf to loosen it from the baking pan and lift it (all in one piece) to a nice serving dish. NOTE: I do not add salt to this recipe because there is plenty of salt in the other ingredients. NOTE: By baking this on a sheet pan (rather than a loaf pan) the grease will run out onto the pan and not &quot;soak&quot; your meatloaf.You shouldn't have much &quot;grease&quot; if you use 90% lean ground beef.